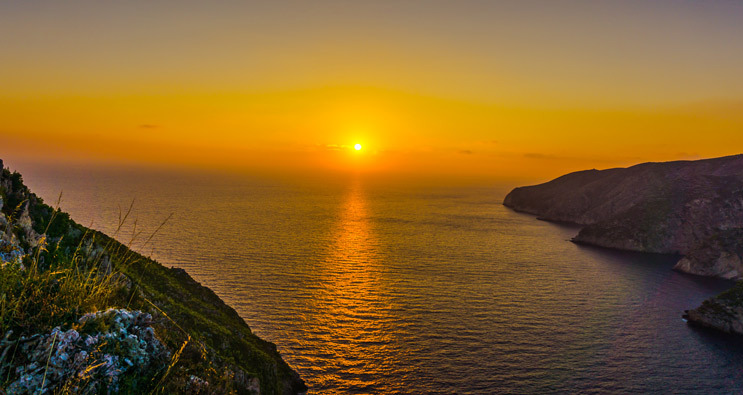 Just before the reddish sun falls into the waters of the Ionian Sea, dozens of pairs of still eyes admire this magnificent sight at the Lighthouse of Keri every day. The Lighthouse was built in 1925 to help the passing ships avoid crashing into the sharp rocks in this area. The alternating shades offer the visitors a unique view. You had better leave the car a few meters away and walk to the edge of the Lighthouse to admire the sunset. There, you will also have the opportunity to see “Mizithres”, two rocks that seem to have been planted into the sea and guard the caves of Keri. Kampi is located in the west side of Zakynthos: a small village with stone-built houses, surrounded by vineyards and olive trees. 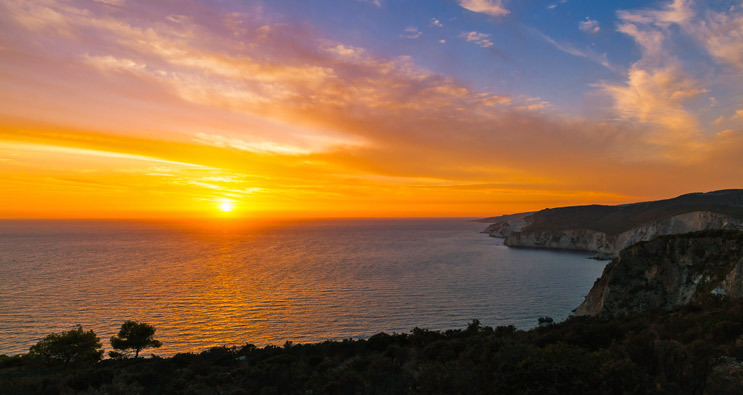 At the edge of the village, on the cliff overlooking the bay of Schiza, the visitor will see one of the most beautiful sunsets of the Mediterranean. The sunset at Kampi is renowned and offers unique moments of romance to loved couples. As far as the visitor's eye can see, the sky blends with the sea and the colors in the sunset are enchanting. Either with or without clouds, there are no words to describe the scenery.